Mom's Gone Bronson! : LBL - Don't Be Embarrassed! Be Confident and in Control, with Poise! LBL - Don't Be Embarrassed! Be Confident and in Control, with Poise! Light bladder leakage, also known as LBL, is more common that perhaps people realise, yet we don't like to talk about it and it hasremained quite taboo asthough it is something to be ashamed or embarrassed about - but it is not! There are many reasons why you may experience LBL and it is worth talking it over with your doctor to check that things are functioning as they should "down there" but once you know where you stand, and before, Poise is here to help! With several pantie liners and pads in various lengths and thicknesses, Poise look a lot like a pad you might use monthly but hold moisture in a way that is more convenient for LBL instead. Poise keeps you dry and fresh through a leaky sneeze or something a little heavier and they offer the kind of security that you need on a day out or gathering with friends, without leaving you to worry about that "uh-oh" moment when you either had to go and didn't quite make it or a little leak caught you by surprise - again, it happens more than you think and you are not alone! LBL can affect anybody, and is thought to affect up to 45% of American women! For an in depth look at the causes of LBL you can take a look here, Many causes of light bladder leakage are treatable or manageable when seen and diagnosed by a Dr and so it is always best to consult with a medical professional to find out what is really going on with your body so that you might get help that you might have been too embarrassed to seek out - don't be affraid to talk to your physician! They have seen it all and they want to help! Poise is there for you in the mean while and whether you need a slim, small, discreet liner or a fuller pad that is also discreet, comfortable and absorbant for day to day use so that you don't have to worry about that awkward moment! After having 3 children, I can honestly say that I have had moments where I could have used Poise on hand, but luckily, 9 months after having my 3rd birth, things are getting back to normal "down there" somewhat and things are definitely looking up with pelvic floor excercises, which you can do any time and anywhere without even batting an eyelid! I highly recommend them! What are we so affraid of!? Lets get the coversation started and why not look to Poise!? 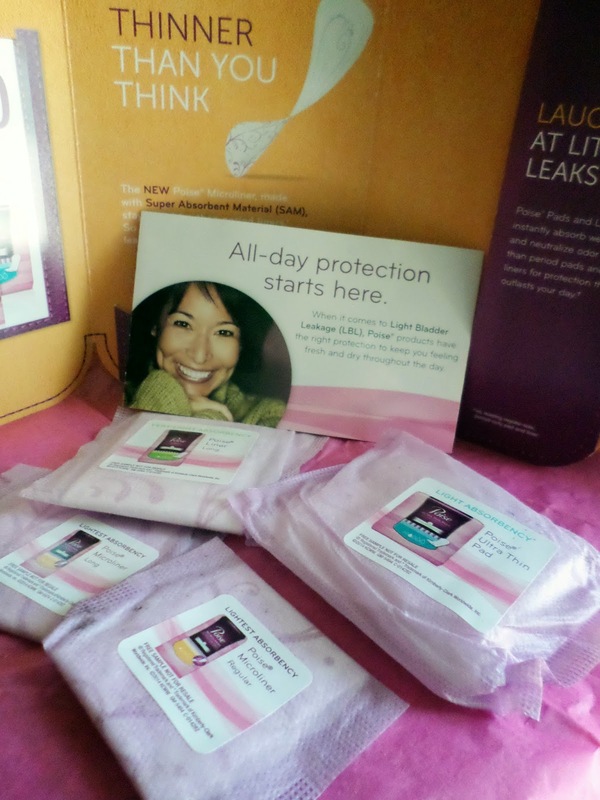 I received a sample of Poise from Crowdtap in order to talk about them and to see for myself how pads like these have advanced. I was not in any way compensated for my thoughts or views on them and I did not receive any other product/s for my time. My opinions are honest, open and my own. Your views may differ. Thank you.